MORNING MANNA : Dec 27 - ALL PRE-PLANNED! Dec 27 - ALL PRE-PLANNED! Long before we were born God pre-planned and determined everything concerning our life. He planned where we should be born and where we should die. He planned which country we should be born in, who our parents should be, whether we should be born into a rich family or a poor family, how long we should live on this earth, and also which places we should live in while living on the earth. “He determined the times set for them and the exact places where they should live” (Acts 17:26 NIV). In Psalm 139:16 we read of a book. There is a book in your name. “In Thy book all my members were written.” What complexion you should have, what height you should grow to, and what colour of eyes you are to have, etc. are all pre-planned. “You saw me before I was born and scheduled each day of my life before I began to breathe. Every day was recorded in Your book!” reads the verse in the Living Bible. How important it is then to learn of everything God has planned for us and surrender to it! Abraham fitted perfectly into the plan of God and what a blessing he became! Even thousands of years after his death he still is a blessing. Dear child of God, don’t run wherever you want to. Don’t ever murmur about God’s plan in your life. It is best to surrender to the perfect will and plan of God. God has a grand plan for you. If we surrender ourselves and our own plans, the Lord will beautifully work out everything in our lives in accordance with His plan. Nothing happens accidently in the lives of those who love God. 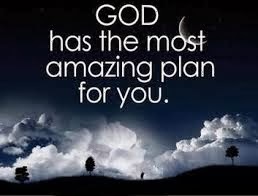 Everything is planned by God.